Run by specialist staff (CALL, FAACT, KEYCOMM, SCTCI, TASSCC and others) and funded by Augmentative Communication in Practice: Scotland and Communication Matters, this is a chance for families of children with additional support needs to try out and learn about software, hardware, and specialised communication technologies. If you are a professional you are welcome to come along with a family you work with. The day is FREE, but please book a place in advance, and tell us the ages of the children you are bringing. Any special arrangements your family may require? Call on 0131 651 6236 in advance of the day. 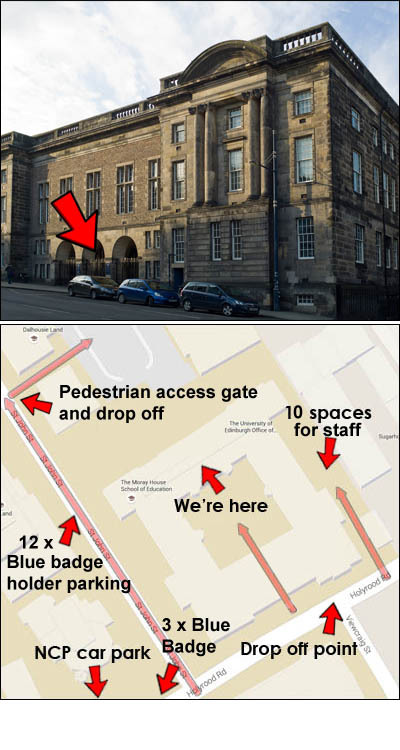 There is pedestrian access (via gate) on St John's Street. There is also an NCP car park at the bottom of St John's Hill (£6.30 for the day, but make sure your parking ticket is stamped to get this reduced price). Holyrood Road: a bay big enough for 3 cars in front of the Paterson's Land building. St John's Road: a small turning circle in front of the pedestrian gate. CALL Scotland would like to store your information in electronic format within the terms of the Data Protection Act.